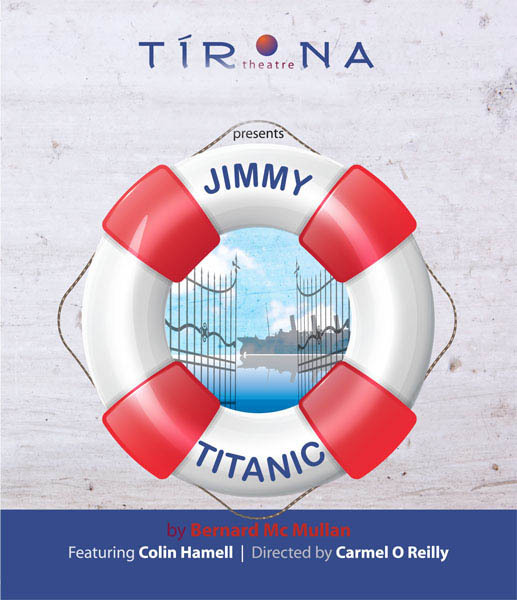 "God and Gabriel are just two of some 20 delightfully outrageous characters – all portrayed by Colin Hamell - in Bernard McMullan’s darkly funny Jimmy Titanic…….Colin Hamell is the real entertainer." "Colin Hamell has the energy and passion of a holy roller evangelist. They must carry him out on a stretcher. 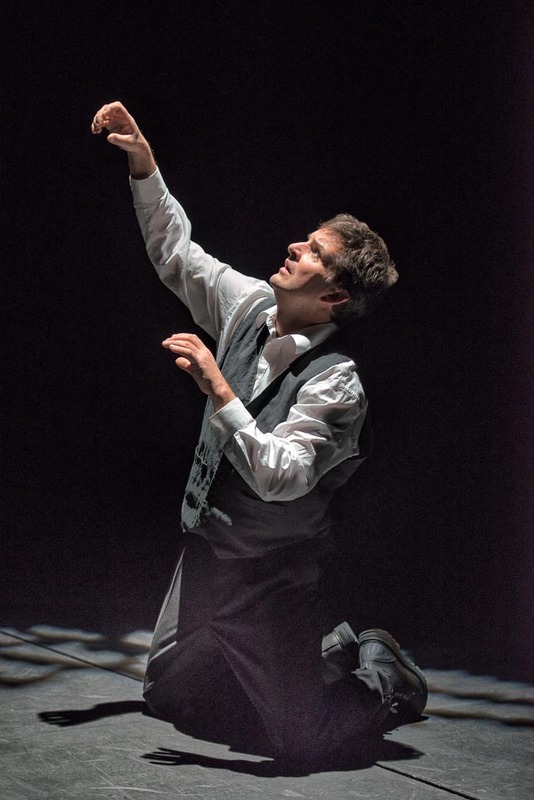 The mercurial actor zips from role to role with only a change of lighting and blink between, if that. Most characters have distinguishing cadence. His portrayal of the unsophisticated, jaunty, and likeable Jimmy is irresistible. Hamell occupies the stage with dynamism and focus. Director Carmel O’Reilly utilizes the small space with terrific ingenuity. 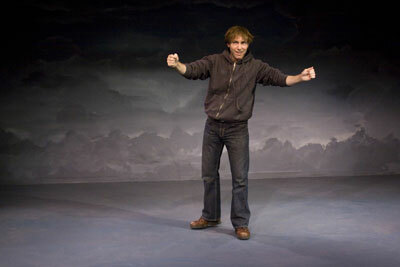 Her actor is rarely still for long and manages to effect location changes by interacting with a single piece of movable set. Physicality is paramount. I gather from the playwright that some of the more outrageous attributes depicted are the collaborative invention of O’Reilly and Hamell. 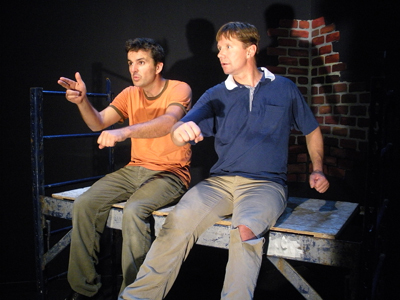 The fast paced production pauses when effective, then continues headlong with a steady hand at the helm." Suffice it to say that Leenane is no city of brotherly love. 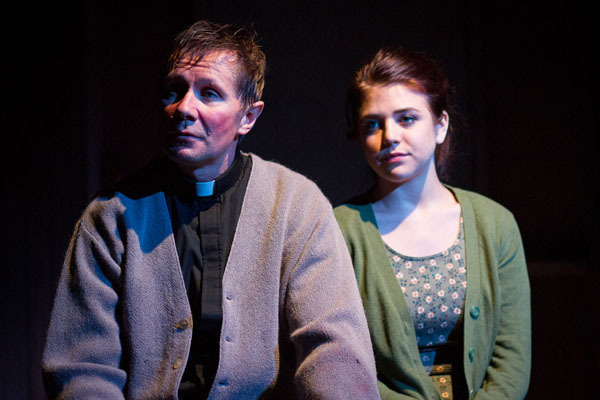 "Carmel O’Reilly directs a slam-dunk production, and the performances are terrific. 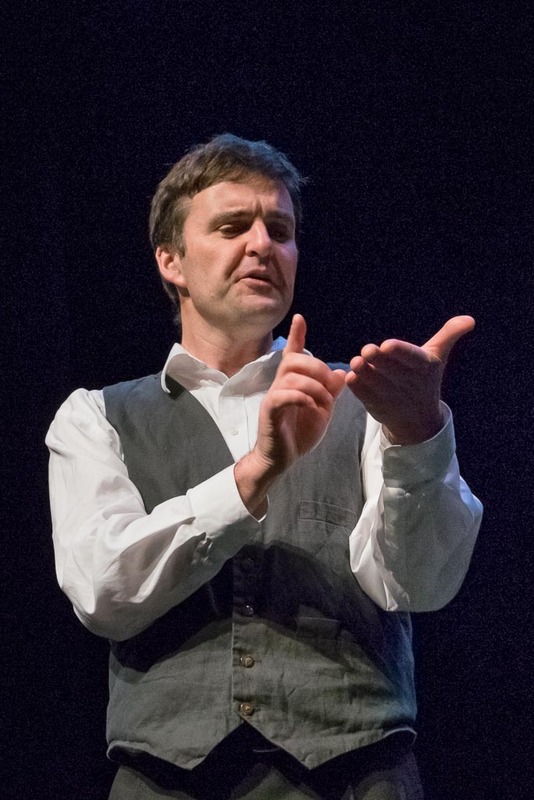 Billy Meleady is a spry, merrily mean Valene, Colin Hamell a slightly thick, sadistic Coleman. In the midst of the mayhem, Derry Woodhouse, as Father Welsh, tenderly delivers a touching monologue about the power of forgiveness. And Lisa O’Brien’s Girleen is the breath of fresh air that the other characters, albeit holding their own breath, so desperately need." 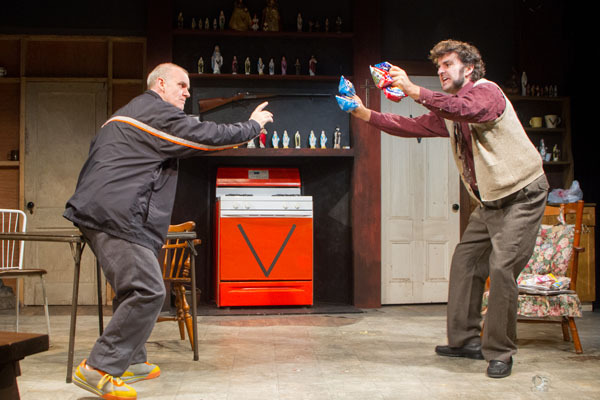 "In a small Irish town that's fast becoming the murder capital of the world, two brothers battle it out over a dead father, an inheritance and a packet of crisps. 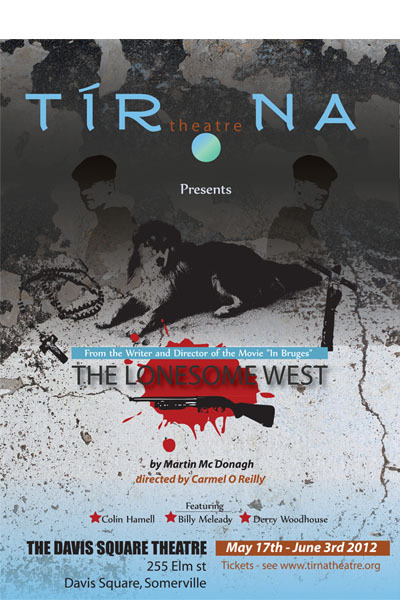 The Lonesome West is the third installment in Martin McDonagh's award-winning Leenane trilogy. " "Out in Leenane, a little town in the west of Ireland, the bodies are piling up in a rash of murders and suicides. Brothers Coleman and Valene Connor have just buried their dad, who met a bad end with a shotgun. An accident, supposedly, but the truth behind his gory demise fuels the brothers’ bitter, profane, petty, and violent struggles." 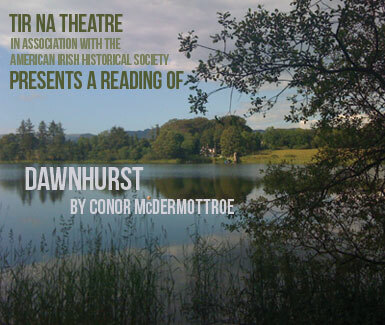 Tir Na Theatre in association with The American Irish Historical Society, presented Dawnhurst, written and directed by Conor McDermottroe. Dawnhurst: a play about truths, untruths and the vicissitudes that occur when reputations are on the line. Set in County Rosscommon, Ireland in the 1960s, we meet Ellen Edwards and Rose Noonan who visits the former Countess on the first Sunday of each month to repay a loan borrowed by her husband a number of years prior. An unlightly relationship develops between the disillusioned Irish woman and the eloquent, well-spoken English noblewoman. However, on this, the last visit, an unfortunate event changes their lives forever. 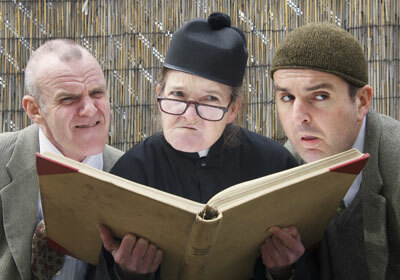 For more information visit the First Irish Theatre Festival. "So funny I wept, so tragic I couldn't stop laughing — yes, there’s no doubt about it. 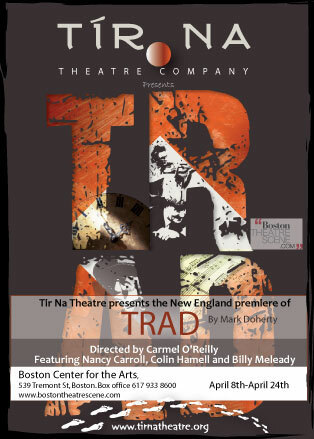 Mark Doherty's Trad is a quintessentially Irish play." "Tir Na producing artistic director Colin Hamell, Billy Meleady, and Nancy E. Carroll — play the piece with precision and wit, with only the mournful strains of Morgan Evans-Weiler’s fiddle and Chad Kirchner’s guitar to hint that Trad, though bent on propelling its stunted characters either out of this world or into the future, is more than just a lampoon of boastful, blindered, blarney-strewn Irish tradition." 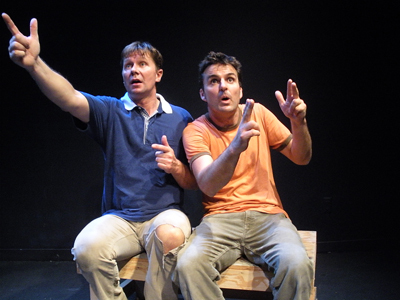 "Doherty's play tackles that issue through absurdist comedy. 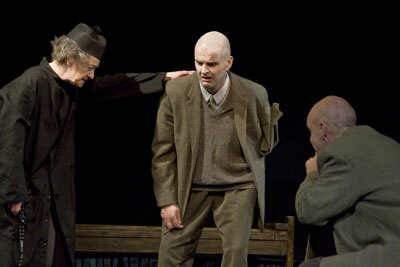 Hamell plays 100-year-old Thomas, who goes on a bit of a quest with his 150-year-old Da, played by Billy Meleady. Nancy E. Carroll, fresh off a Broadway run in Present Laughter plays a 150-year-old lass named Sal and the tale-spinning Father Rice." 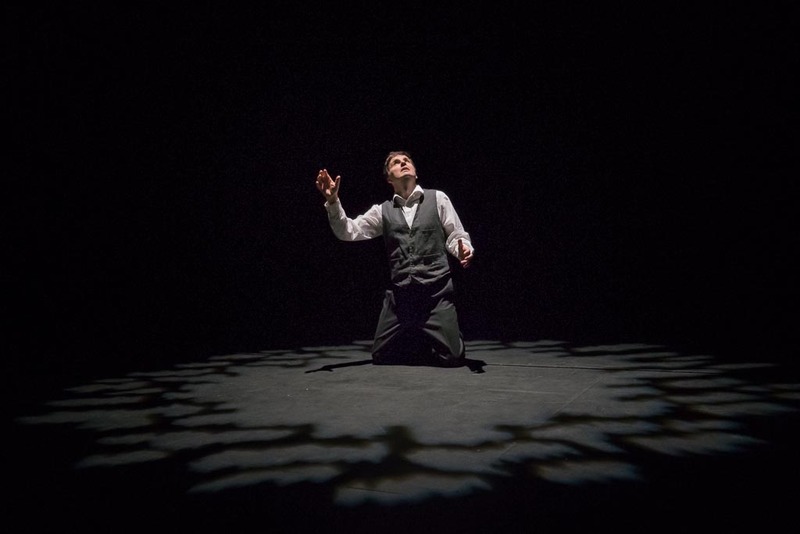 "Two haunting plays by Conor McDermottroe from the new Celtic Gothic idiom get splendid productions in the Plaza Black Box theatre at the Boston Center for the Arts, 539 Tremont St. in the South End. 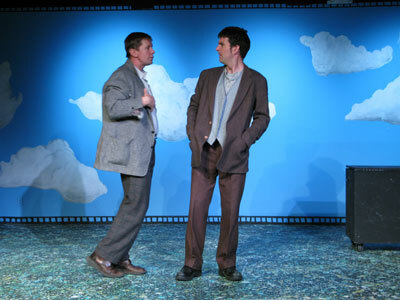 Tir Na Theatre Company (which translated from the Gallic means Land of Theater Company) presents a new play from McDermottroe in tandem with an earlier play the author himself once performed." 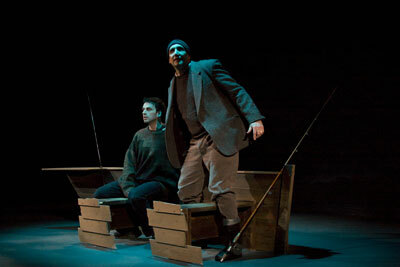 "Take the pair of beautiful plays Tir Na will be doing at the BCA till 14 March. As Bottom of The Lake opens, there in the merest whisper of Karen Perlow's delicate lights two men sit in a boat --- half a boat, actually, the near side implied --- arguing whether they just heard the bells strike twelve, or eleven. It's New Year's Eve and they're out to catch the first salmon of the season"
"These days, Irish playwright Conor McDermottroe can be found in Dublin editing his feature film Occi Versus the World, based on his one-act play Swansong, which won strong reviews in New York, Edinburgh, and London"
Bang the drum. Raise a glass. Let the celebrating begin. 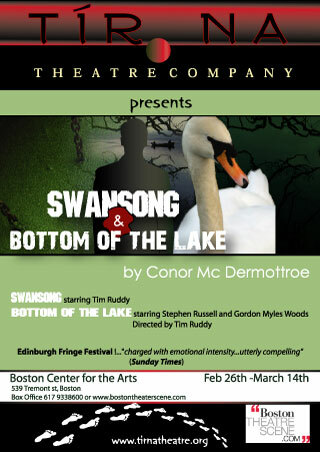 "There’s a new Irish theater company in town! Most of us are still mourning the loss of the Sugan Theatre and we were beginning to think we would have to do without. But Tir Na has leaped onto the scene with a flourish. 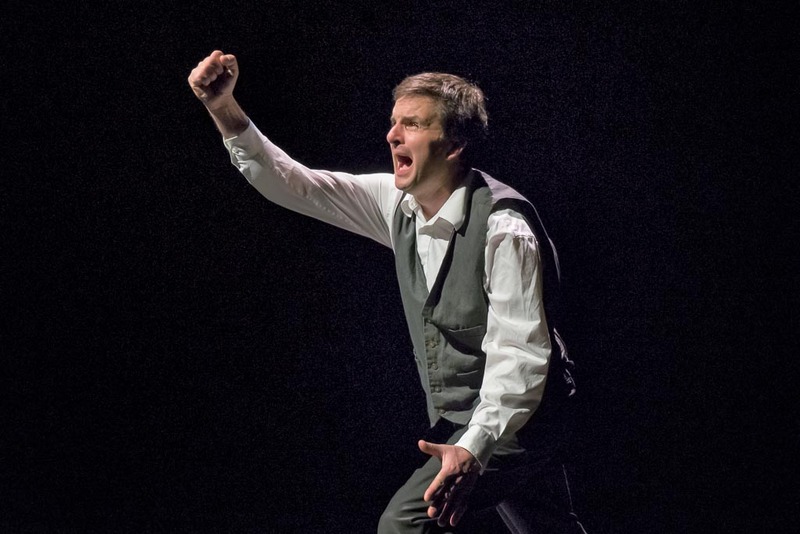 Their dazzling production of Marie Jones’ Stones in His Pockets will set a high standard for the new company. Jones’ delightful send-up of location movie making is rumored to be based on the Tom Cruise-Nicole Kidman vehicle, Far and Away. In Stones, just about everyone in this sleepy little Irish town wants in on the Hollywood experience. What makes Stones remarkable is the cast. Place two actors in front of an azure sky and let ‘em rip. The two impersonate extras, crew, stars, directors and town folk, male and female---at the drop of a hat, with the turn of a head or a shift in body weight. 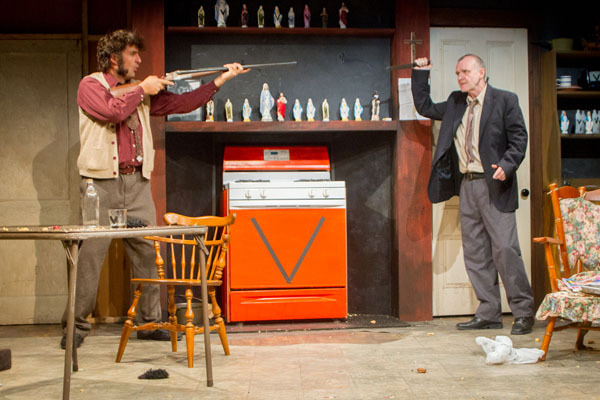 The trick is a tour de force for two talented actors and Colin Hamell and Derry Woodhouse deliver in spades!" 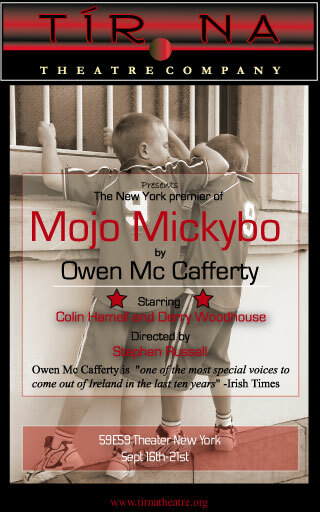 "The troubles of 1970 Belfast permeate the lives of Mojo and Mickybo, two boyhood friends who sense the possibility of being murdered in their beds, whose parents are isolated from them and from each other, and who yearn to escape. Yet these concerns are ancillary to most of the action of Owen McCafferty's play, which instead tracks schoolyard fights and reenactments of Butch Cassidy and the Sundance Kid. While it may be true that even in times of crisis, boys will be cowboys, repeated faux-gunshots have a limited appeal."